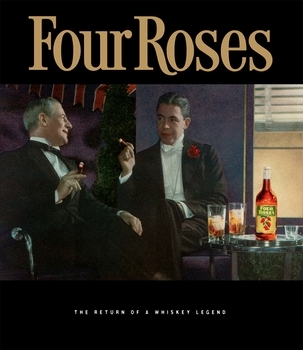 As with the story of just about any American icon, the legendary story of the highly acclaimed, award-winning Four Roses brand is filled with folklore and adventure, family feuds and romance, with a cast of colorful characters any fiction writer would die for. A father and son enamored of the Southern cause during the American Civil War; another son, a Confederate Colonel, who dies defending Atlanta; and his sons who would successfully turn the family business into one of the last family-owned whiskey brands in the United States; a whiskey magnate from Canada who would alter the brand's composition within the United States and drive it to be a "bottom shelf" brand; and, finally, a passionate and determined master distiller who would never give in until Four Roses regained the prominence it once had with the American public. Historian and Four Roses brand ambassador Al Young puts his storytelling talents to good use in this masterfully told history of what was once the most popular and best-selling bourbon in America, a brand so revered that it took its rightful place at the top of Times Square in New York, along with other beloved brands such as Coke and General Electric. It is a story of this international brand's humble beginnings, and perhaps the startling truth behind how the brand actually got its name — contrary to legend; how the label was almost driven out of existence in the United States just a few decades ago; and how it rose from the ashes to its current place and stature in the world, which includes such countries as Austria, the Czech Republic, France, Germany, Italy, Japan, the Netherlands, Spain, Switzerland, the United Kingdom and, of course, once again the United States. If the Four Roses story is familiar to you, you will find this book a fascinating and long overdue journey with a trusted old friend. But if this is your first taste of the brand and its history, you might want to pour yourself a sip or two, relax and get ready to savor every moment.